Shoreline Community College Theater presents the world premiere of Off We Fly Now which will be performed as a mixed media experience in collaboration with Shoreline’s Visual Communications Program to combine live action with animation. 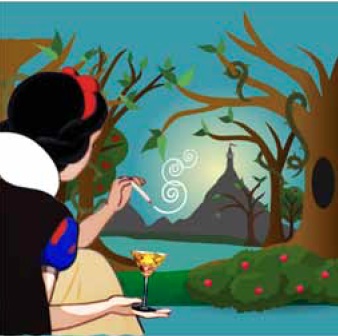 Snow White, Cinderella, Little Red Riding Hood, and Sleeping Beauty, have found a way to escape from their centuries old fairy tales. Arriving in the “real world” they quickly attract the attention of the media and the public. As the four attempt to discover the meaning of life, they end up becoming reality show celebrities. Then they begin to realize that the real world, similar to the fairy tale world, is full of tricks and traps. Fame, love, youth and marriage are each unsolved riddles. Off We Fly Now challenges the boundaries between fairy tales and the truth. Perhaps, after all, the tales were written to prepare us for life in the real world. Main Characters: Cinderella, Snow White, Sleeping Beauty, Little Red Riding Hood, Deer, Apple, Horse, Journalists, Rapunzel, Ensemble. SCC Theatre, 1600 Bldg., 16101 Greenwood Ave. N., Shoreline 98133. 206-546-4728. Director Duygu Erdogan Monson is the newest member of Shoreline’s growing Theater and Film Department. In her native Turkey, she has over twenty-years working as a professional actor in theatre, television, and film. She also founded an award-winning feminist theatre company in Istanbul and was a lecturer at Beykent University, Istanbul. Despite a language barrier, Duygu auditioned and landed several roles in New York City, before moving to Seattle, where she continued to work as an actor, and entered the PhD program at the University of Washington, School of Drama. She is presently completing a dissertation that looks at the Ottoman relationship with Europe and how the Turk image was created on European stage, ballet, and opera. She also is participating in the collaboration between the City of Shoreline and Shoreline Community College to establish a professional film studio here. Depicting a Disney character holding an obvious alcoholic drink and smoking is just asking for a lawsuit from the entertainment behemoth. Bad taste.